Industrial Machinery Division（Mass Production） | MAEDA SEISAKUSHO CO.,LTD. In our Industrial Machinery Division, we develop, manufacture, sell and service original products such as Spider Cranes. Not only for the domestic market, we have now expanded our network and provide Maeda products globally. Customer requests from all over the world have been incorporated in the development of all our new products. The Maeda Spider Crane has mainly been used in the stone industry throughout Japan, but recently it is finding new markets in curtain wall installation, glass installation, plant equipment installation works as well as the building and repair of factories. 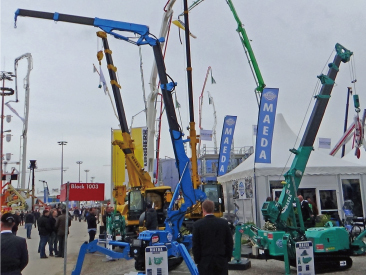 Also for indoor works, the Maeda Spider Crane is becoming more and more popular as the electric motor allow work to be completed without gas emissions. 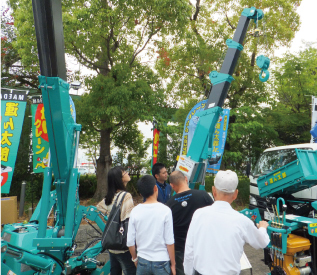 Mini Crawler Cranes are another series of Mini Cranes that Maeda manufactures. The 4.9t Crawler Crane has the No.1 market share in Japan and is mainly used in confined construction work sites. As the Maeda company is located in a cold region of the world, so products such as anti-freeze vehicles and sprinklers are our specialty too. They were developed after requests from municipal agencies and are now used by many municipal agencies in cold and snowy regions. Other original products include the mini trolley, OEM products, cargo cranes and aerial platforms.